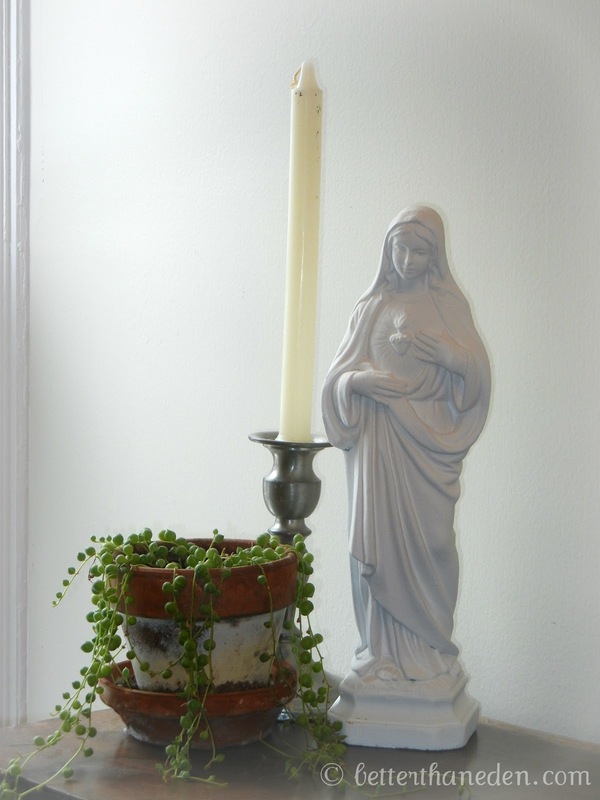 A few years ago a friend passed along a statue of Mary as they were paring things down before they moved out of state. (Thank you, Becky!) It wasn't in the best of shape and every time I saw her (slightly creepy) eyes staring at us in the playroom I would make a mental note to fix it up someday. Just the other day I finally took the few minutes to give Mary a little bit of a makeover. I know you are just shocked that I painted it white. ;) Nothing fancy but it's an improvement and I love the simplicity of a white statue. Or white anything really. If you don't have the skills to make a statue into a beautiful work of art, then I say go white. It's hard to mess it up. I'll have to find the right place to put it where it can be a little visual reminder of grace. Not something to be worshipped but something to help forgetful people like me remember that there is more, so much more than this life and that God uses real people to work out His amazing plans. I am especially excited that her eyes have less of the creep factor. Because Mary isn't creepy. She's pretty awesome. You know what would be a neat idea? 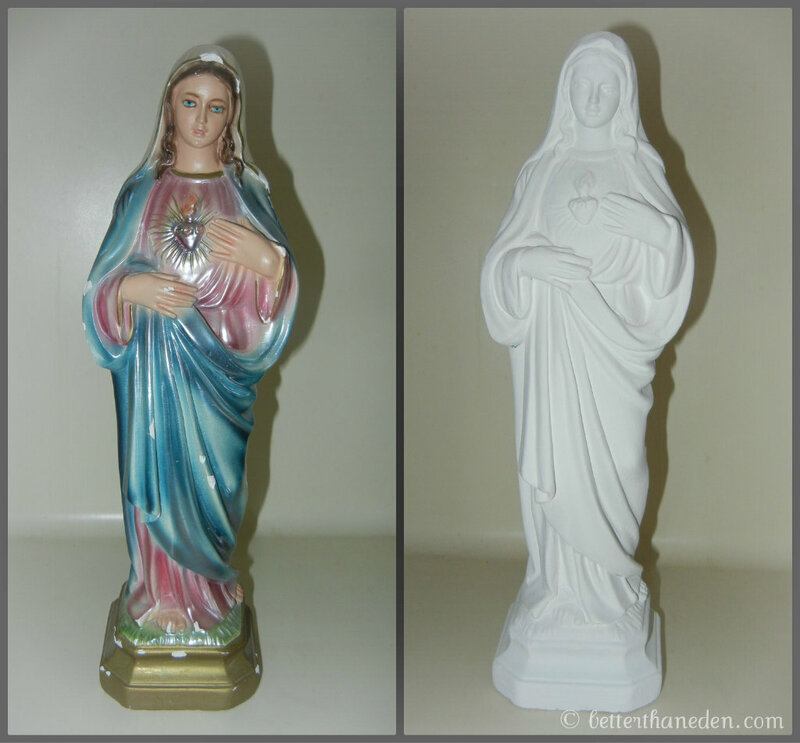 When you see those chipped and sad looking statues at thrift stores and estate sales and whatnot, buy them and give them new life with a little coat of paint. Then give them away so that others can have that reminder of God's grace in their home. Hope you're having a lovely Saturday! lovely. i've been planning to do the same some statues around my home. i was desiring to use milk paint and antiquing it a bit to get a vintage look. what paint did you use? I used some Annie Sloan chalk paint I had left over from painting the cabinets. It gives a neat soft finish, although I don't have the wax you're supposed to use over it. Milk paint would be beautiful as well! I'd love to get a little supply of that here. She's lovely! I agree sometimes badly executed religious art can be quite creepy and often simpler is better! That looks great! 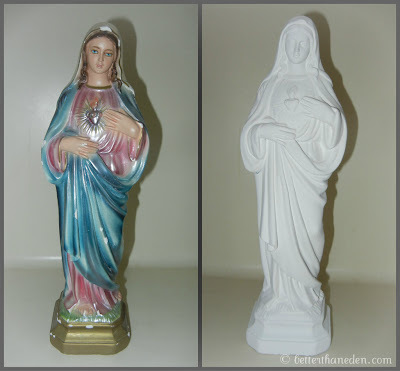 I have a few statues from my Grandmother that can use a makeover too! Oh, this is so lovely, Mary! I've always passed over chipped and creepy statues at sales, etc... but now I'm kicking myself. I can't wait to start looking again! This is such a great idea! I have never thought about making over statues.